Fameshed is back with a new round for October, and for the event The Loft brings a little love to the foyer with the Oren set, an opulent foyer table and decor that will no doubt leave your guests speechless. An updated take on an age old piece, the Oren foyer table will sit proudly in your grand foyer or any room of your home, with a traditional style updated for todays trending decor available in three wood variations, cherry, onyx, and driftwood. . 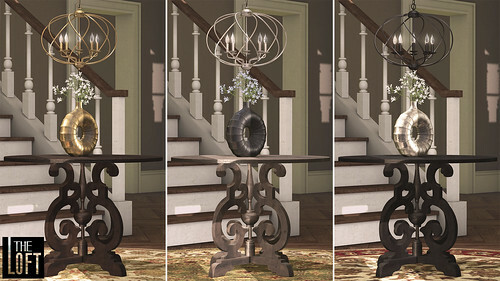 The Oren foyer set also includes a uniquely shaped, eye catching vase and a simply elegant spiraled sphere chandelier, both available in 3 different metallic colours, gold, silver and black. Each piece is sold separately. The Oren foyer set is 18 land impact as displayed and come with copy and modify permissions. These pieces will be available at Fameshed for the month of October.